We all have them. That’s right, we all have a few beauty horror stories. Here is one of mine I’m currently experiencing and would like to share with all of you. Up until recently, I had my nails done about two times, maybe three. This year however, I got them done a lot. It all started back in July when my man and I went to New Jersey for vacation. “What a perfect time to get my nails done,” I thought. And it was. They were cute and simple pink and white tips. Just enough elegance for a nice time away. After that I didn’t get my nails done for a few months. Then, in September of this year, I made it a regular event. I decided I was going to treat myself to getting my nails done as a reward for quitting smoking. Everything was great. My nails looked super cute, I was happy with them, they made me feel girly, and most of all, I LOVED the way they clicked off the keyboard while typing. One of the lady’s I work with noticed I had been getting my nails done. She asked if I wanted to go with her to get our nails done together. Once she told me the price I was sold. It was half of what my nail salon charges. Now, just so you know, this lady who would be doing our nails is the wife of one of our other co-workers and she does them from her house. I have nothing against that and applaud people who can have a lucrative side income because I wish to one day be able to do that with my homemade candles, but really, I should have been a little more cautious. I still had on artificial nails from the last time I had them done. They were about 3 weeks old when we went to get them done and just about ready to fall off. For those of you who get nails know how uncomfortable it is to be missing only a nail or two you know why I decided to try to keep the old nails on until our appointment. Anyway, in my opinion, she should have removed them and put new tips on but she didn’t (I’m also a licensed cosmetologist in the state of Pennsylvania so I say yes, they should have been removed NO QUESTION…but anyway…). She filed down the leftover acrylic with the electric nail file and on my pinky nail of my right hand filed down to my natural nail bed. BELIEVE ME I FELT IT!!! It hurt SO bad and even drew blood. Realizing that she had drawn blood, she quickly put her index finger over where the blood was coming from and applied pressure. Now I know what you’re probably thinking, why didn’t I say something? Well, she is Spanish and has very limited English and even though I’m learning Spanish, my communication is still very limited. So with that said, I just hoped for the best and tried to prepare for what I knew was to come. 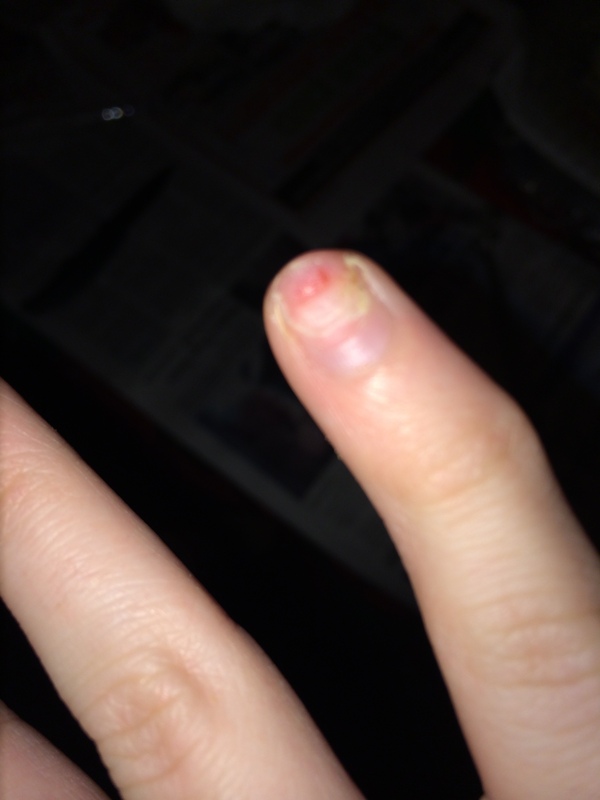 When she applied the acrylic on my nails, I could feel the open wound on my poor little pinky. It burned until it dried (which wasn’t long) and then it felt fine. I remember looking at the finished product being so pleased with the exotic nail art she did and they fun style of the nails. I did notice that my right pinky nail looked a little more red than the other nails. I figured ti was from the little “nick” during the electric filing and thought nothing of it, that is, until my nails started popping off. 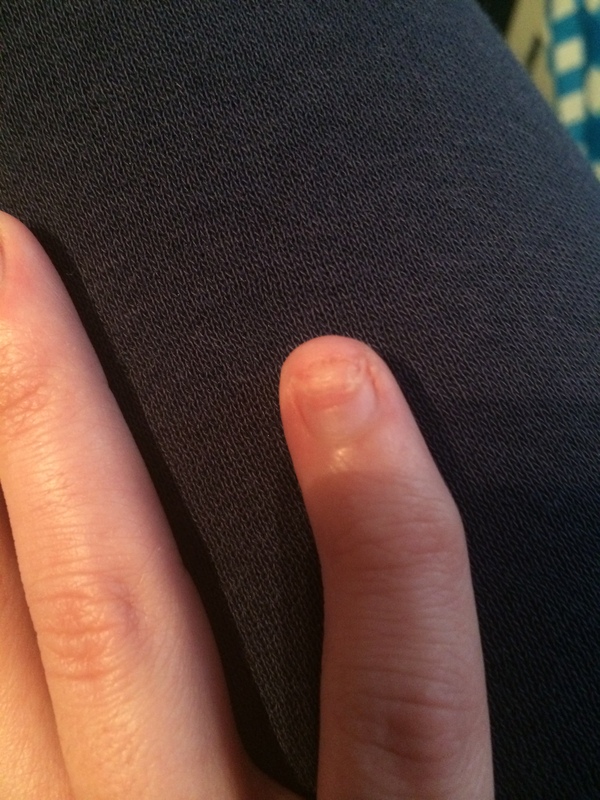 The lady I work with made an appointment for us and I had to cancel because I literally was (and still am) missing half of my real nail with half of my nail bed exposed. You can see the redness of the pinky finger compared to the other nails. This was the day I had them done. 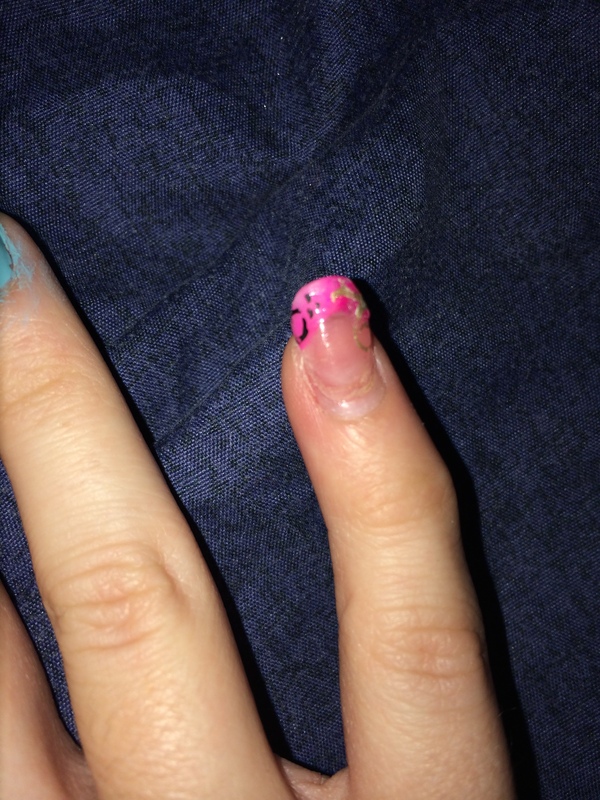 This is after my artificial nails fell off. I didn’t want to take this one off because I could feel and see that part of the nail bed was exposed, although, it’s hard to see that in the picture. Here is the day the nail fell off on its own (well, mostly). I did have to assist the process because it was dangling off my finger. 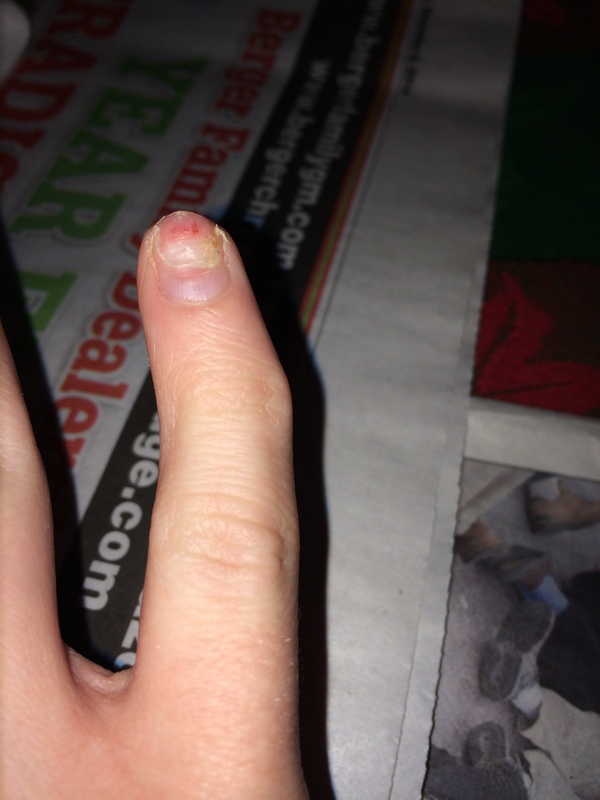 This is my finger today. 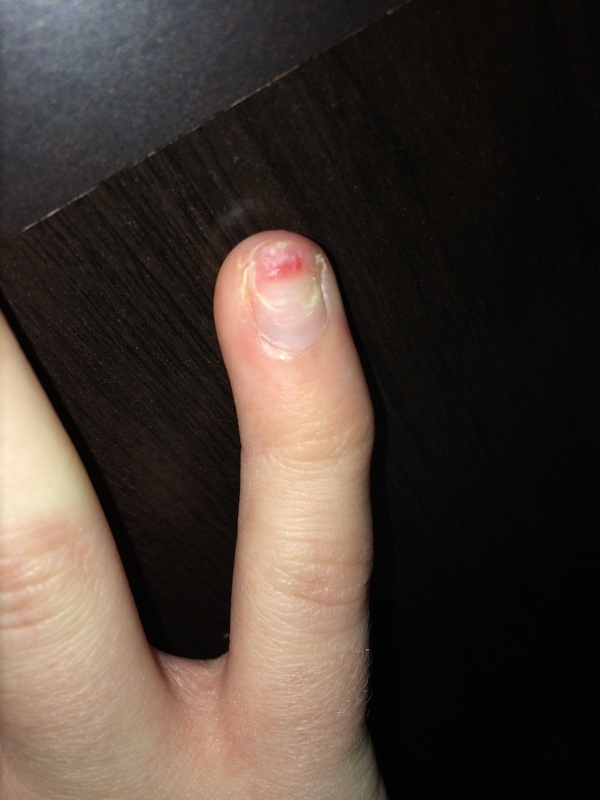 It didn’t capture as well as I wanted that only half of my nail is there. So long story short, I won’t be getting my nails done for a long time. I’m more than content with my short fingernails and painting them myself after all of this. I know they say beauty is pain, but I think this was a little unnecessary pain. I really hope none of you ever experience something like this, but if you have comment down below what you did and how you handled it. Also, if you have any other beauty horror stories you’d like to share, comment down below. I’d love to hear them! 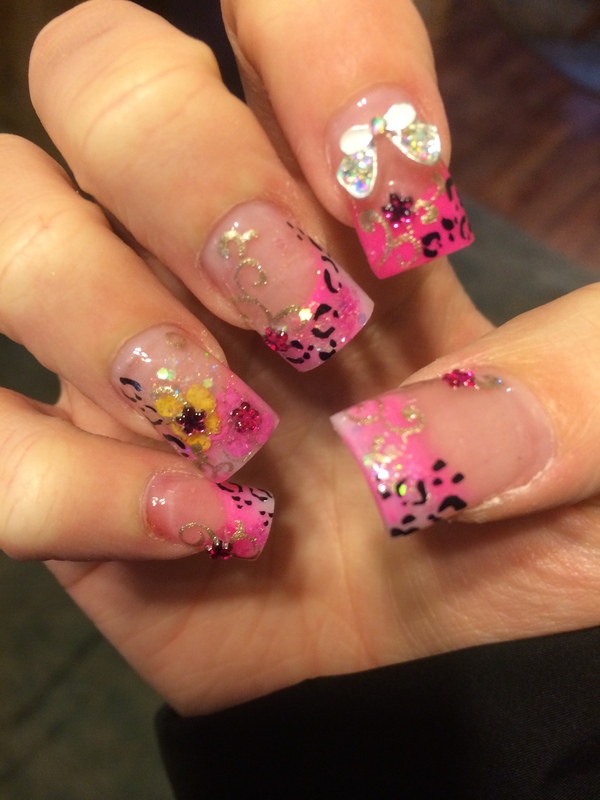 Pingback: What incidents can nail salon insurance cover?